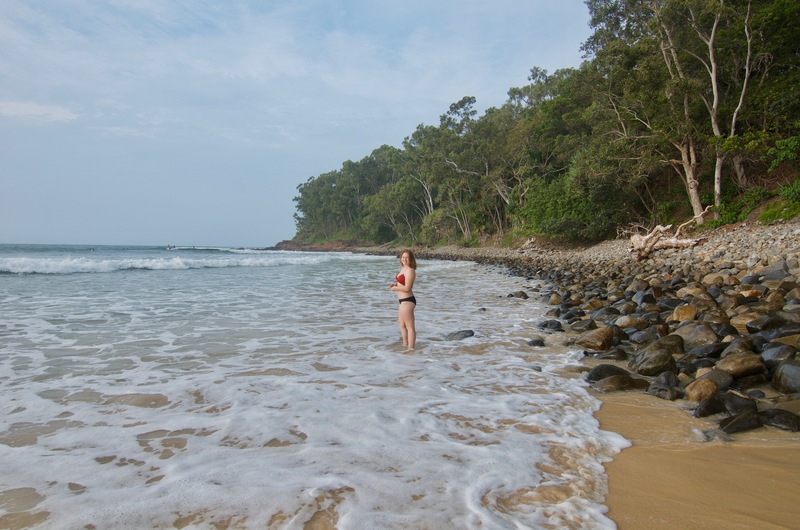 Arriving at Noosa National Park was like arriving in an entirely new world. It was our second day in Australia, and we were already blown away by the uniqueness. The vegetation was different, the land was different, the animals were different (I learned what pademelons were only when one hopped out in front of us!) and even the sounds were different. I woke up early that morning to the sounds of the rainforest, excited at the day ahead. We were lucky to spend our day exploring the top Noosa National Park Walk: The Coastal Track. Noosa National Park is located in the town of Noosa, on the Sunshine Coast of Australia. The general climate there is subtropical, hence the name “Sunshine” Coast. There is a lot of sunshine, and a whole lot of humid heat. Although it was not sunny the entire walk, we had to keep our shoulders covered and wear a wide brimmed hat to survive the humid Queensland weather. The park is free to enter, and offers many different walking tracks for visitors to enjoy. Some cross through forests, one climbs up a hill, and one offers a coastline walk. The top Noosa National Park Walk is by far The Coastal Track. The entire walk is 11 km roundtrip, and took us most of the day to complete. We did not complete the entirety of the track, but stopped at Alexandra Bay and headed back the way we had come. With lookouts, beaches and various other stops on your way, it would be best to give yourself an entire day to enjoy all the track has to offer. Although this is not technically part of the Noosa National Park Walk, we began our journey here. We parked in the lots within the main area of Noosa, and walked through the town admiring the cute shops. I had the absolute best smoothie I have ever had at Blended Health Bar, which included dragonfruit, mandarin, mango, pineapple, passionfruit, and coconut water. Energized, we walked to the main beach, up some stairs, and came upon Little Cove. It is such a picturesque spot. I recommend visiting at low tide, as during high tide there is no beach access. We were able to access the beach and swim, while watching the surfers that were further out from the shore. It set the bar very high for the rest of our day! We entered the park by walking down a boardwalk next to the road, and came upon the visitor centre. There we encountered the large and terrifying but harmless Huntsman Spiders, as well as a whole bunch of bush turkeys. As we walked through the forest there were gum trees everywhere. As a native species to Australia, I will be forever mesmerized by these unique trees that provide a home for koalas. Our next stop was Boiling Point Lookout. It was nothing too special. The main feature is that under the right conditions, the water rises up through the rock to create a “boiling pot”. We spent little to no time here, but it was clear by looking up ahead that we were in for a treat! This spot was a gem, not only for the beach, but because of the trees! Tea Tree Bay is aptly named after the tea trees, which emit a beautiful smell. The trees were gnarled and looked like something otherworldly. While descending through the trees and onto the beach, a smell resembling essential oil was all around. To my delight, I was shown that rubbing the leaves between your fingers creates your own personal tea tree scent. Tea trees, they smell so good! The beach itself was gorgeous, and we found a spot on one side that was pretty empty. In comparison to the beaches we had seen so far on the Noosa National Park Walk, this one had sand that was much more golden. It was a beautiful rest from our walk! Unfortunately we did not see any dolphins here, but the water was a magnificent color. The contrast between the water color and the black rock was amazing, and definitely one of the coolest views in the park. The next part of the Noosa National Park Walk is Granite Bay, and after this the elevation gains as the track climbs further and further up the coast. The views start to get pretty unreal as you get higher and higher. This was the destination that I was looking the most forward to, as I had seen the cool pictures all over Instagram of people floating in the crystal clear Fairy Pools. Although it is not an official location of the park, if you look closely enough there are signs that will point you in the right direction. The Fairy Pools were a disappointment, because on our way there and on our way back the tide seemed to be too high to take advantage of them. Upon discovering them I was happy that there was no other souls in sight, but quickly realized that meant it was too good to be true. There must be a reason why this Instagram famous spot was empty. The pools are filled by the water of the waves, which means during high tide they are a whirlpool of ocean water. Not a great idea to swim in them then. If I could do it again, I would make sure to keep track of tides, to take advantage of the pools! Not even missing an opportunity to swim in the fairy pools could ruin my day! This lookout was the highest part above the coast, and was a scary look down into thrashing water. Not only was it a far drop, it was also extremely windy. So windy in fact that I had to hold my hat by its string to keep it from flying away. I was amazed by the trees that resided right on the cliffs, bending to the will of the wind. The view from here was amazing, as you could see Alexandra Bay in the distance. The long stretch of beach looked so inviting that we decided we would head down to the beach. It was the best decision we made that day. Our last spot of the day was arguably the best. The beach was long, and it was empty. We set up a hammock and got to relaxing. I spent quite a bit of time just listening to the waves and remarking on the beauty of the beach. *Note: At certain times of the year there are warnings against Marine Stingers (jellyfish). They can cause quite a bit of pain with their stings. While there were no warnings while we visited, we did see many blue bottle jellyfish washed ashore at Alexandria Bay. After walking for hours and hours in the sun, we were famished. On our first trip abroad as vegetarians, we were worried about finding something filling to eat in town. I am happy to report that we found an amazing option! Betty’s Burgers offered outdoor seating covered in shade, as well as an amazing mushroom burger that included crisp fried mushrooms filled with melted Gouda and Gruyére cheese, lettuce, tomato, and Betty’s special sauce. A look at their Instagram page will leave you wanting to make a trip to the Sunshine Coast just to get your hands on their amazing burgers!!! Our day was absolutely amazing. The beaches were serene, the lookouts provided amazing views, and the plants and wildlife we encountered along the way were an added treat. If you are someone that is interested in exploring coastlines, then the best Noosa National Park Walk for you is the Coastal Walk! Want more Australia? Check out our day trip to Moreton Island! Oh my goodness these photos are absolutely amazing! Definitely makes me want to make a trip! Thanks! It is such a beautiful area and such a beautiful park! This is such a stunning beach and ocean line. I have never been to Australia, but hope to go within the next 5 years. I hope you get a chance to visit this park! It is absolutely stunning! What an awesome place! It is embarrassing but I didn’t even know where this was! Amazing views and a fun time! No need to be embarrassed, the world is huge! I did not know about Noosa until about two months before I set off to Australia! It was a fun time! Thanks for reading! I like to highlight both the good and the bad to portray a true picture of my time in a place! I hope you get a chance to visit Australila, it’s beautiful! This looks like an absolutely amazing place to stop. The beach is amazing! I will have to take a much needed trip there. Great Read! It was super beautiful, filled with many pretty beaches! Thanks for stopping by! This looks very beautiful… But is there anything ugly in Australia? My favourite spot is definitely the Tea Tree Bay – I really love tea, that would be a kind of paradise for me! I have yet to find an ugly place in Australia!!! It was definitely a special area, where you can hear the ocean and smell the tea tree leaves! This sounds like a blast! Your pictures are gorgeous! Thanks so much! It was a super adventurous day! Thanks so much for your comment! I would highly recommend Australia- specifically Queensland as it has such a variety of things to see! Oh wow! I use tea tree oil every day and I had never seen the trees before! I wonder if the smell is similar ! It smells similar, but even better! I had never seen the trees either, they were so interesting! I am a Canadian living in Michigan I am so happy to meet you and read this post. It a sigh of relief I’m not the only crazy Canadian who lives here still. Yay for Canadians!! Haha there are still lots of us! That’s insane, I had not read much about it before I visited it myself! I hope you get a chance to see it! Thanks so much, I’m excited for you to get a chance to view its beauty in person! This place looks amazing! This is now on my bucket list! Yay! I hope you make it there sooner rather than later! Looks heavenly and almost like you had the place to your selves. No doubt a wonderful adventure! There were quite a few other travelers, but because the park is so huge there were never too many people crowded in one area. My favorite kind of place! Beaches are my happy place! It was a relaxing day except for when we had to climb up the track to get to the higher lookouts! Thanks so much! Oh wow. That beach is stunning! Clear waters, fairy pools, with not much tourists around! My son’s girlfriend is in Australia on an academic scholarship to earn her master’s degree. I will ask if she’s been to Noosa National Park. If she has not she definitely should check it out! It is a beautiful place to spend a day or weekend! Thanks so much! It was hard not to take pictures of everything I saw because it was all so beautiful! You should! It is definitely worth a few days to wander around the park and the surrounding areas! Thank you for the sweet comment! I love your travel adventures! I need to add Australia to my list! Thanks for stopping by! Australia is definitely a must-see destination! It is different from anything else I have ever seen!